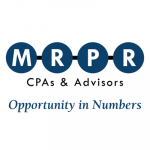 MRPR CPAs & Advisors is a full–service certified public accounting and business advisory firm located in Southfield, Saline and Ann Arbor‚ Michigan. Their services include accounting, bookkeeping, business advisory, tax planning and consulting, trust and estate services, and more. Work For MRPR CPAs & Advisors? Claim This Page.